After growing up in Louisiana until the age of 19 and a long hiatus that took me to Pittsburgh, NYC, and L.A., I'm back in the hot and humid South (North Carolina, specifically). Truth be told, I don't hate the summers here. My skin looks nicer than in the (surprisingly freezing) winter, and I can wear prettier things like dresses and little white tops. That said, wearing the wrong thing during the summer in the South will make or break you. I've learned from the unfortunate mistake of wearing the wrong type of fabric over the years and now know exactly how to avoid being suffocated by my clothes when both the heat and humidity are at 100. I've lived in, or I've at least visited, many parts of the country in my lifetime, and I can say with confidence that if your wardrobe can help you survive July and August in the South, your wardrobe can pass the test anywhere. So without further ado, here's a Southerner/fashion editor's (that's me!) advice for surviving summer (no sweet tea required). 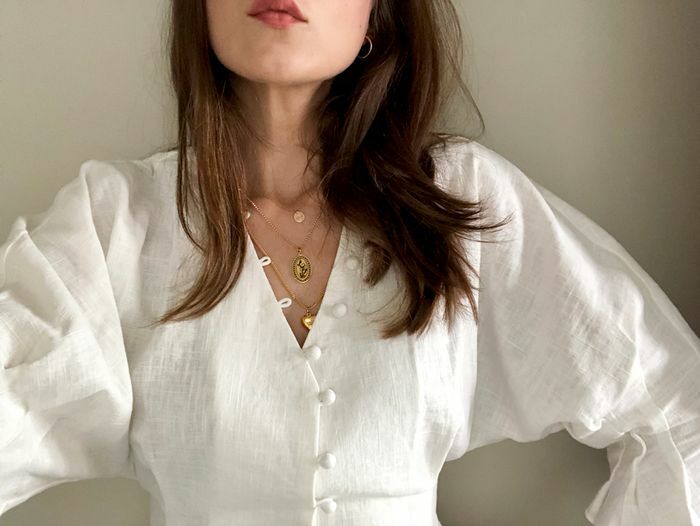 Fabrics like linen, eyelet, silk, and poplin (instead of polyester and heavy knit) are my go-to fabrics. Because air flow. Sure, it's a no-brainer, but I can't even tell you how often I wear dresses and shorts in the summer. There are some days when even the lightest-weight pants just won't suffice. Accessories that could potentially stick to my skin are a no-go this time of year. Instead, I stick to playful bags and cool earrings and hair accessories to elevate my outfits. There are some situations in which you just need to wear jeans (e.g., travel days), so my trick is to find the lightest-weight denim possible, which surprisingly does exist. Re/Done T-shirts are a wardrobe staple for me in all seasons, but they're surprisingly breathable and soft, making them the perfect summer tees. I wear one almost every day. In the heat and humidity, you don't want anything close to your skin, so I've found that cropped wide-leg pants are the best summer pants. Next up, the 2018 trend Southern girls aren't touching.